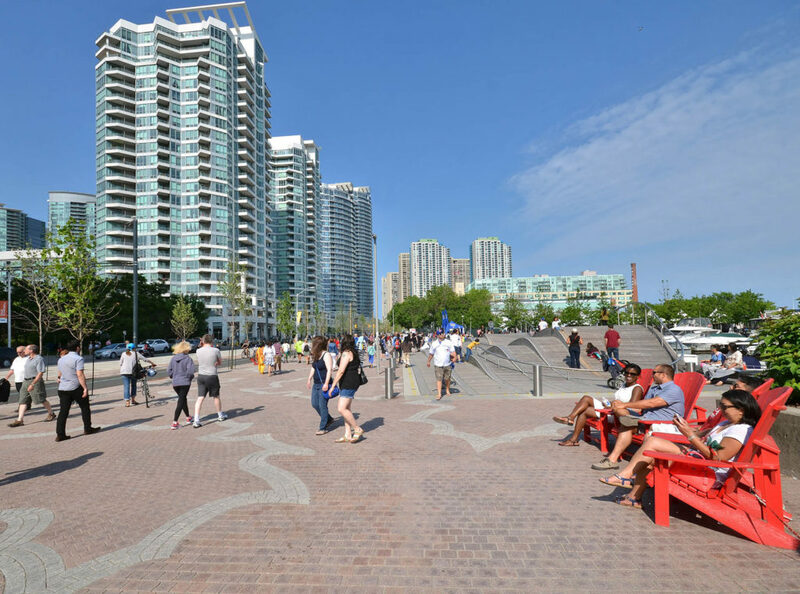 The Toronto Central Waterfront extends 3.5km along Lake Ontario and is in direct proximity to the downtown business district. 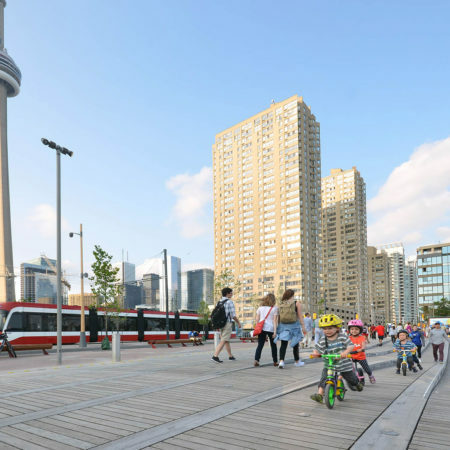 It is one of Toronto’s most valuable assets, which, after decades of patchwork development and efforts, was lacking a coherent vision for linking the pieces into a greater whole. 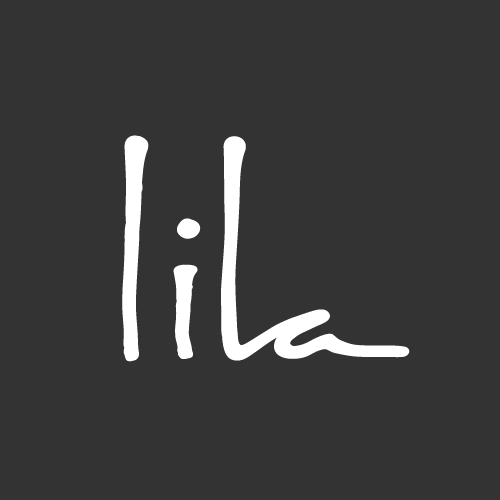 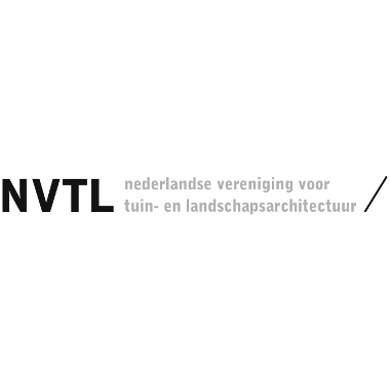 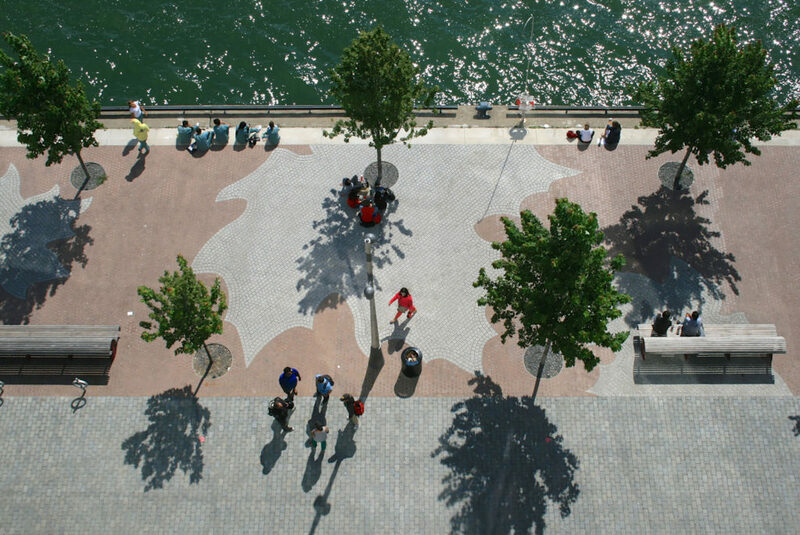 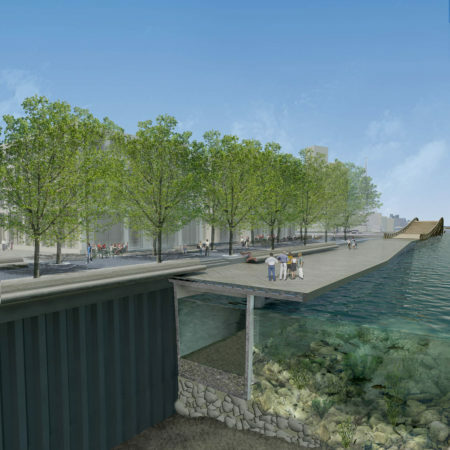 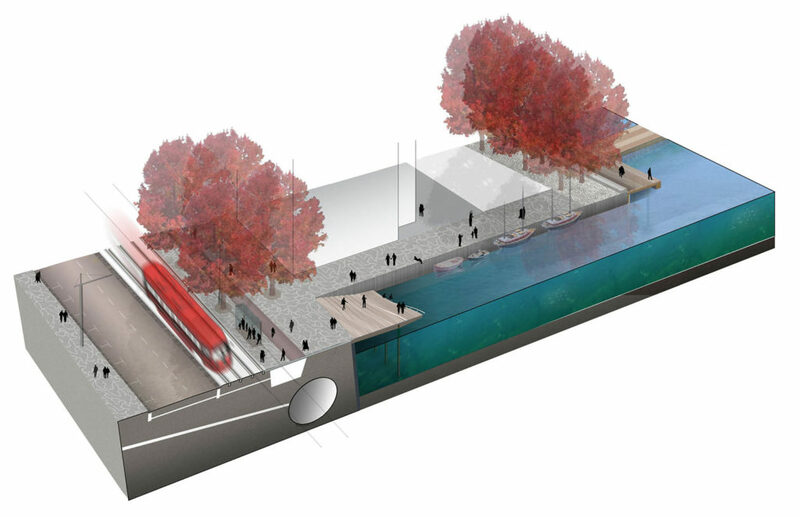 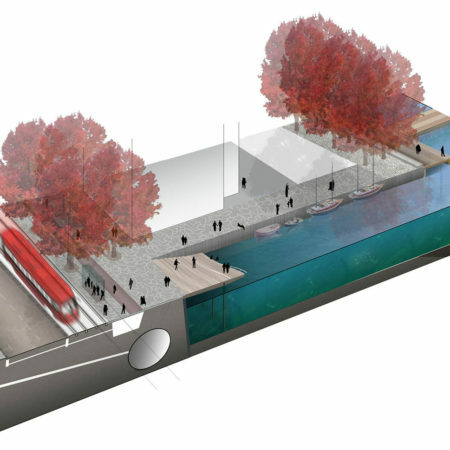 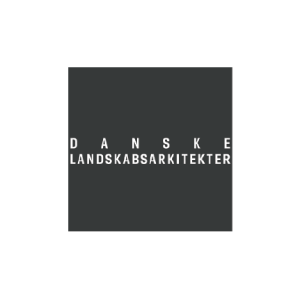 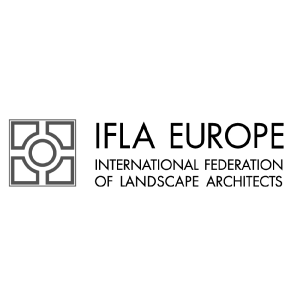 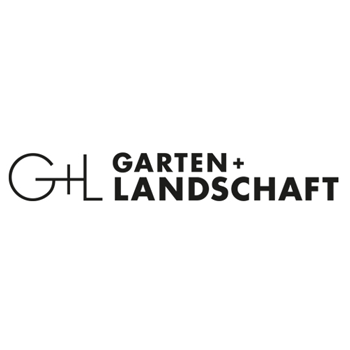 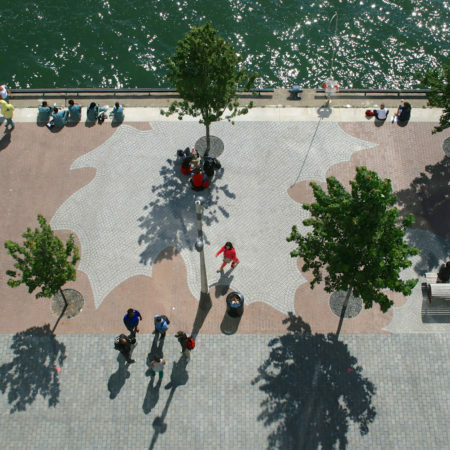 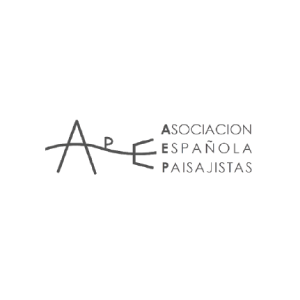 In this context, the fundamental objective of the project, which received its main impetus as an international design competition in 2006, was to create a consistent and legible image for the lakefront. 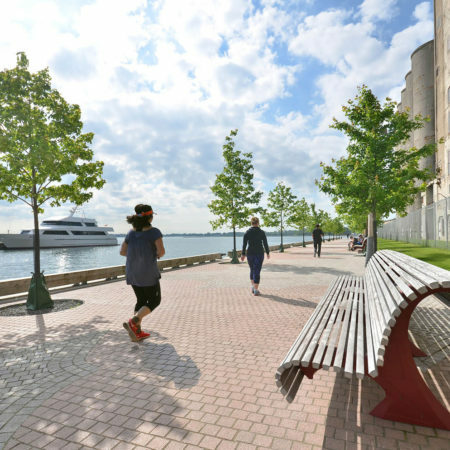 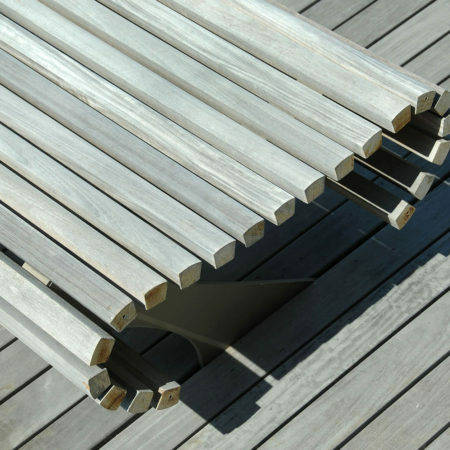 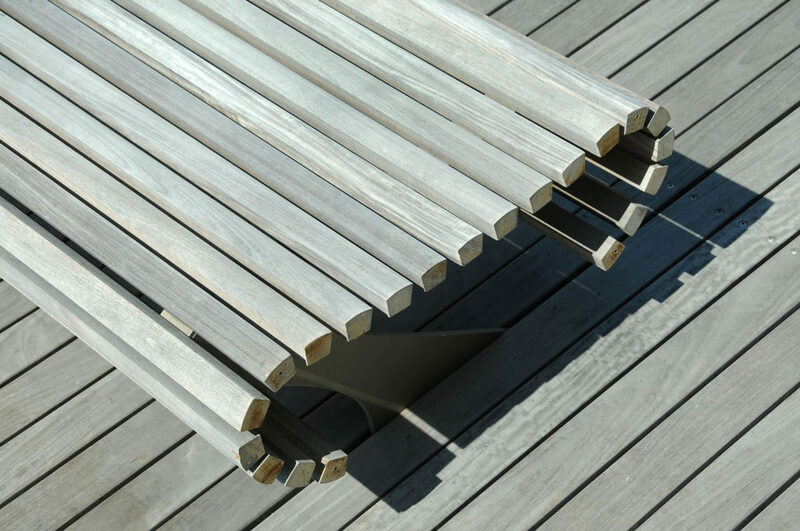 The designers’ priority was to connect the vitality of the city and the lake by means of a continuous, publicly accessible waterfront. 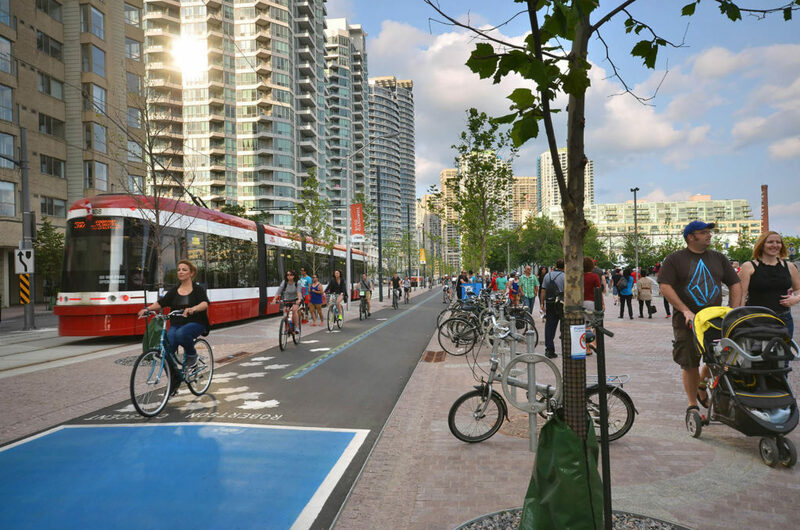 The master plan expresses a vision that brings a sustainable, ecological and productive ‘green foot’ to the rich culture of the metropolis while providing a safe environment that is fit for the future. 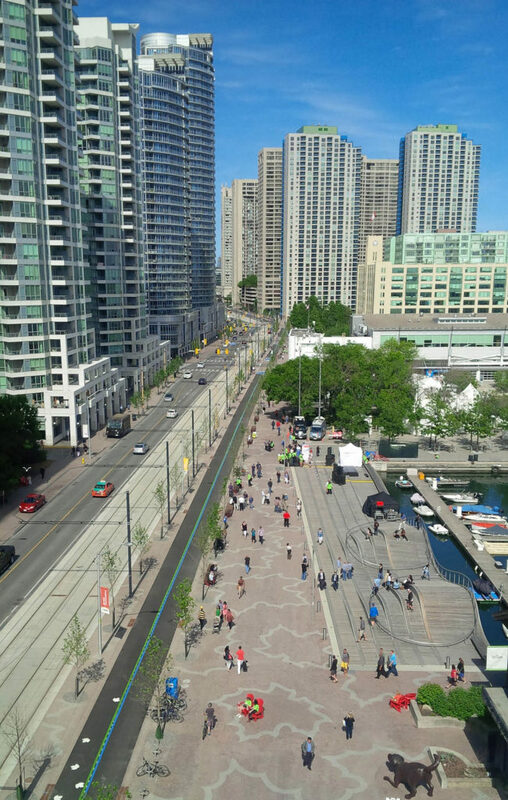 Queen’s Quay runs parallel to the Toronto lakefront from east to west. 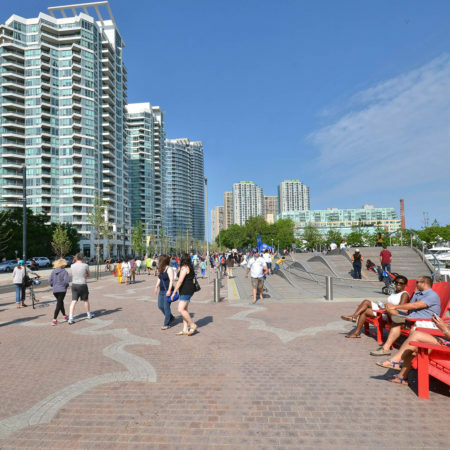 It is the main waterfront street of Toronto and a vibrant new pedestrian promenade ever since it opened to the public in 2015. 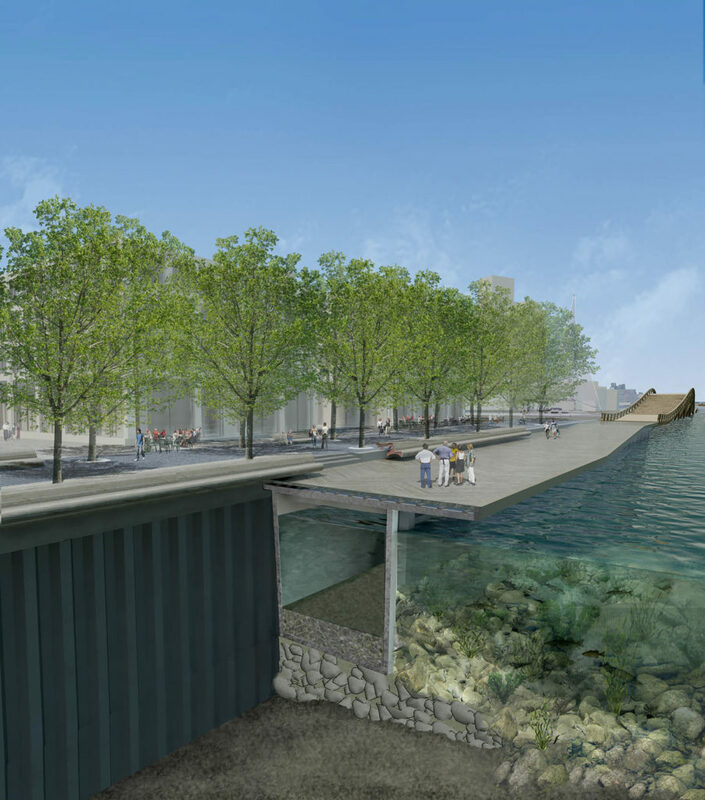 This 1.7 km long boulevard connects various precincts and public spaces along the waterfront. 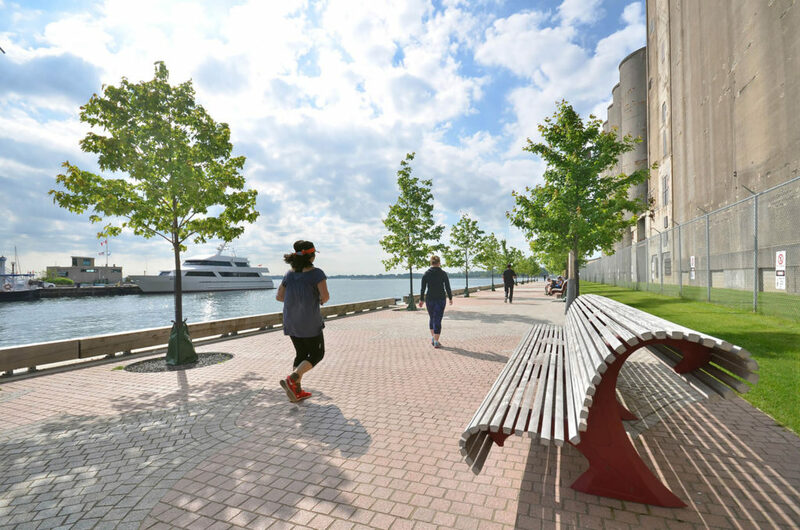 The joint venture of West 8 + DTAH was tasked with unlocking the potential of this location and transforming it into a contemporary vibrant urban environment. 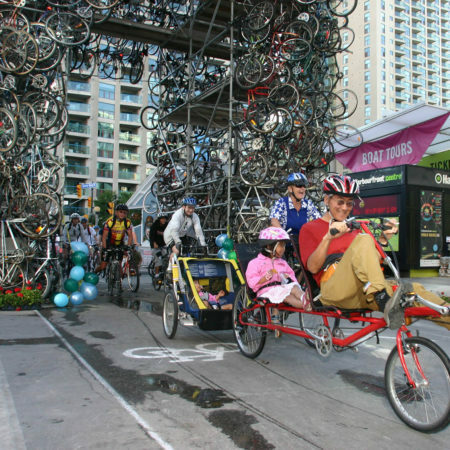 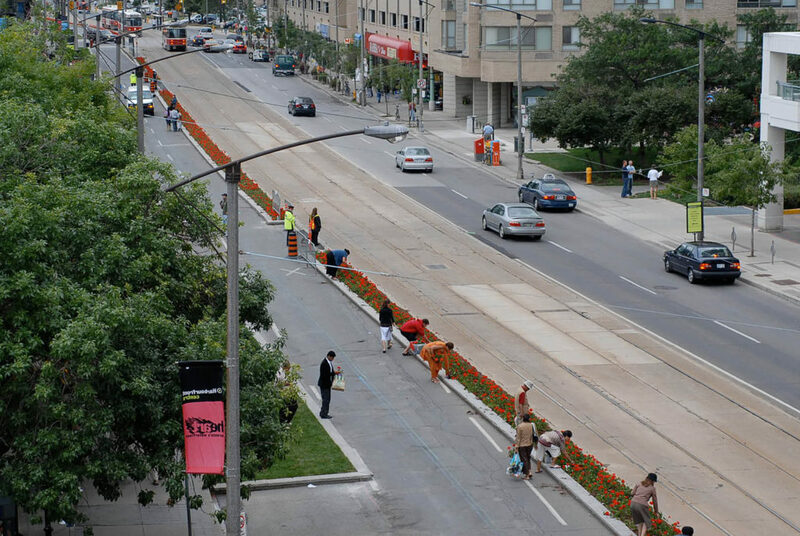 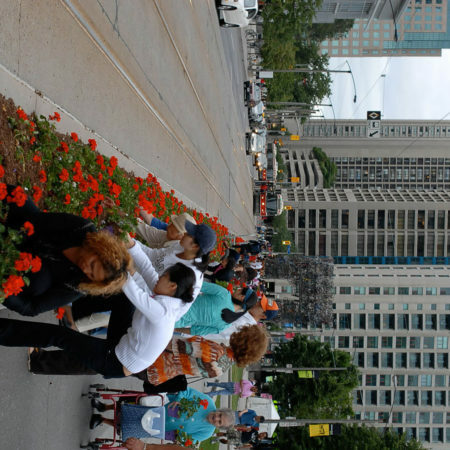 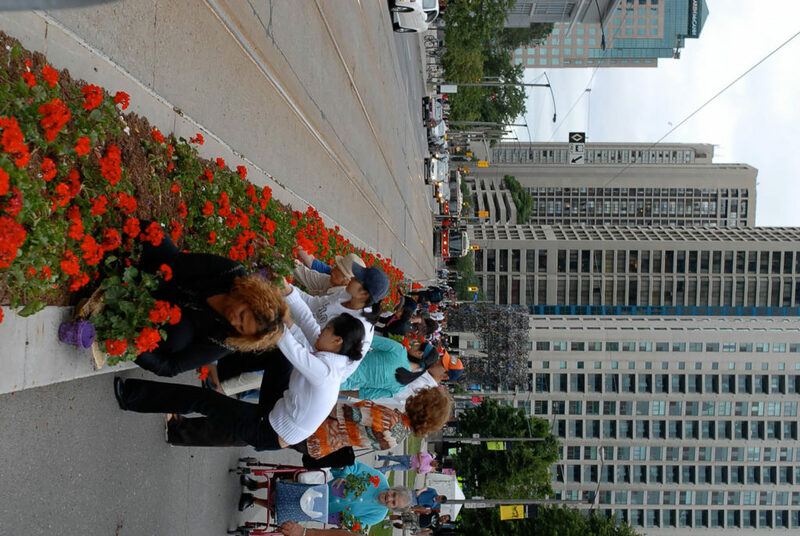 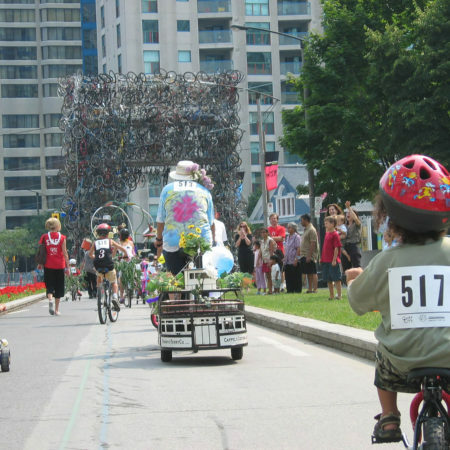 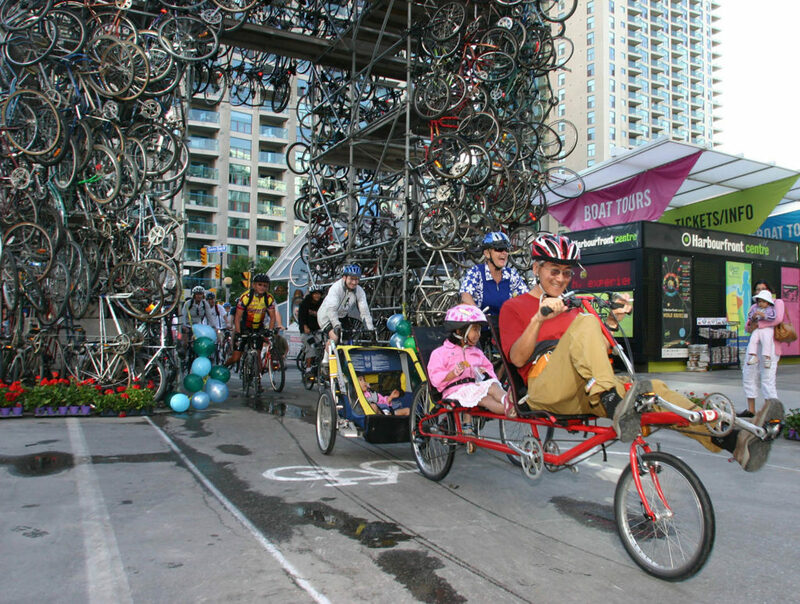 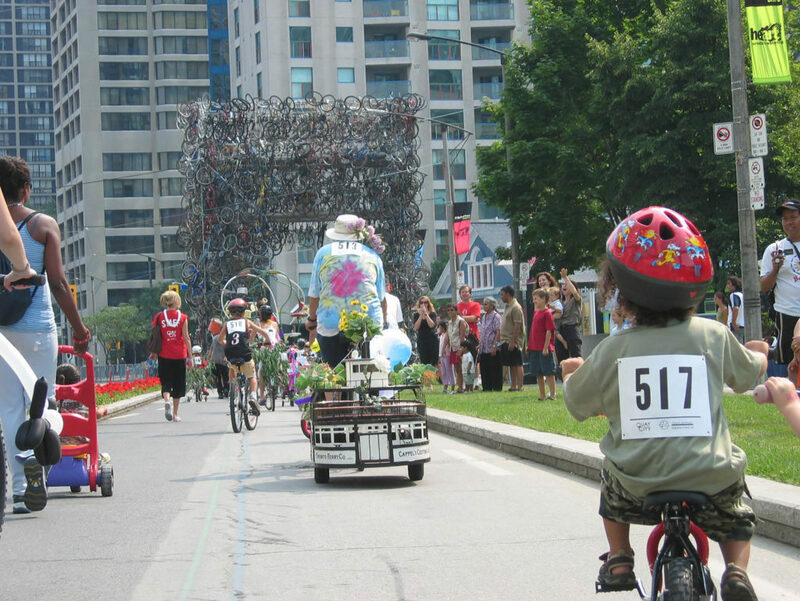 After winning the competition, the designers initiated Quay-to-the-city, a 10-day installation with an arch of bikes and thousands of flowers indicating a bike lane which demonstrated the boulevard’s potential. 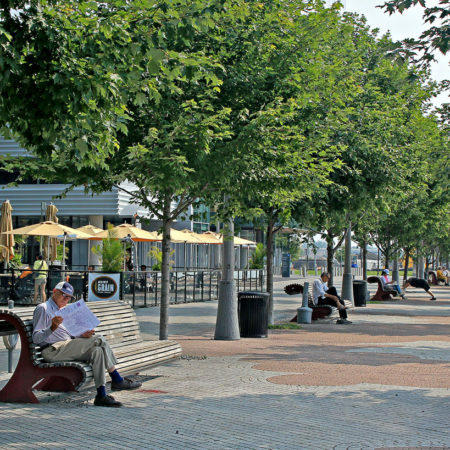 Previously dominated by four lanes of vehicular traffic with narrow sidewalks and inadequate public transit facilities, the redesign reconfigured and reduced traffic to two lanes north of the reconstructed Light Rail Transit Corridor and allowed space for a generous pedestrian promenade on the south side of the street. 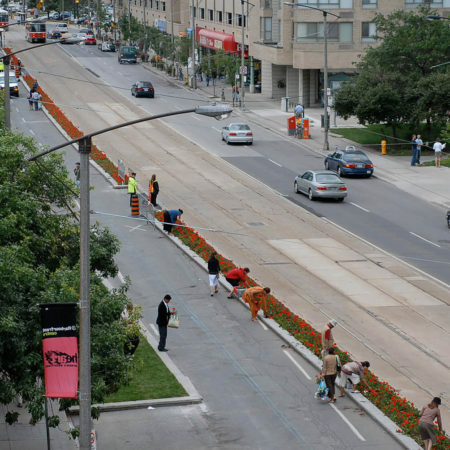 In order to warrant the fluidity of daily traffic, halting vehicles can use new side pockets to avoid interruptions. 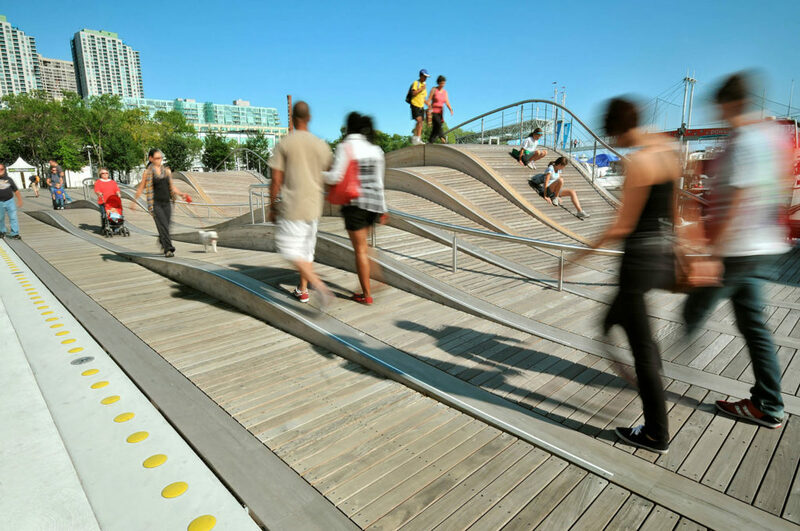 The enhancement of the sidewalks also considers interaction with the north side facades, fostering economic vitality. 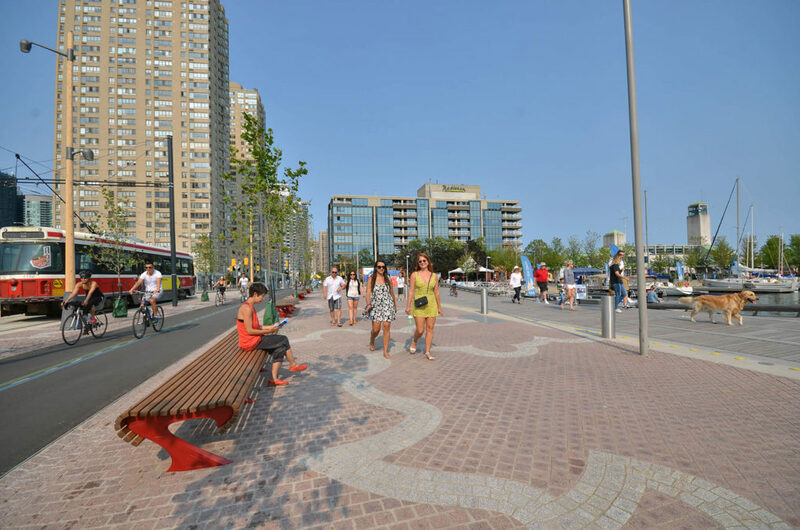 The designers extended the Martin Goodman multi-use recreational trail on the south side of the street and turned the boulevard into a public realm that is both functional and beautiful; what was once a barrier is now a pedestrian and cyclist-friendly corridor. 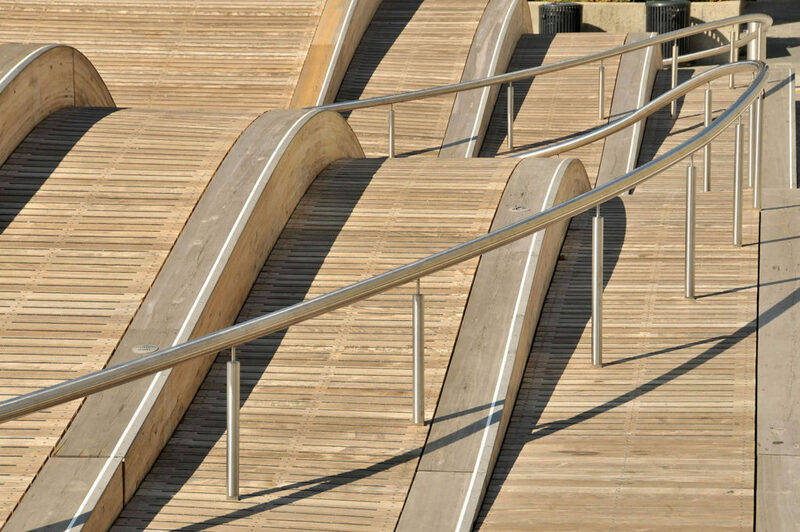 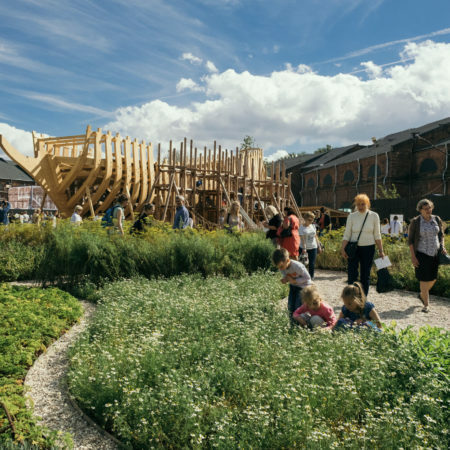 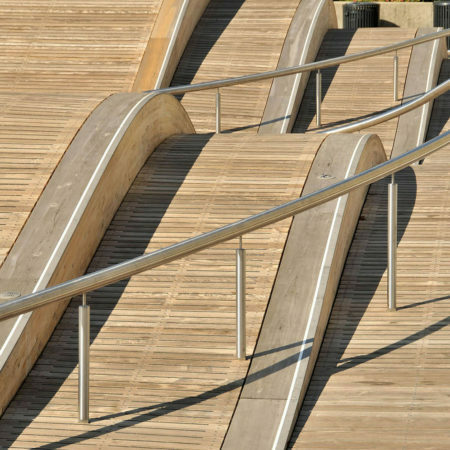 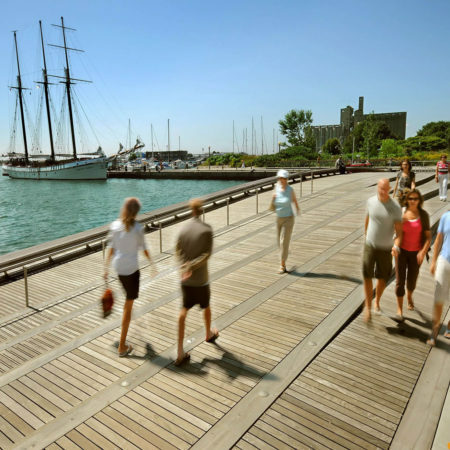 At the heads-of-slips, new ‘Wavedecks’ extend the boulevard beyond the quay walls, creating a floating wooden waterfront that provides boat moorings and public spaces while inspiring a range of activities. 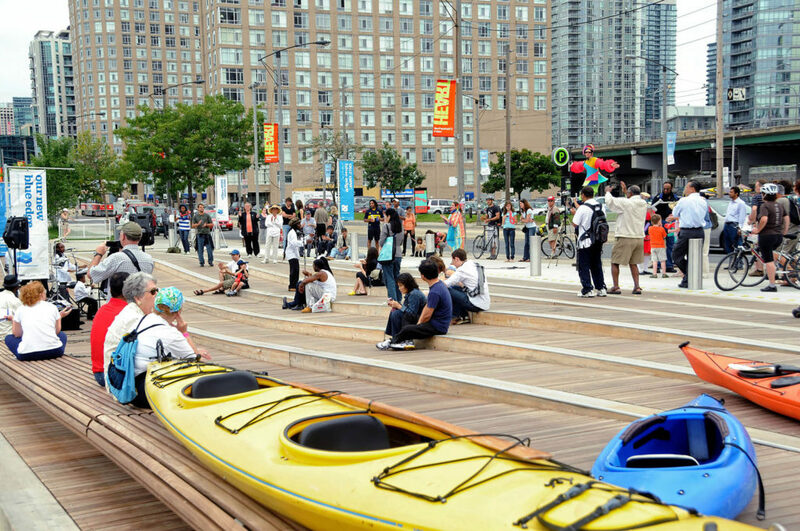 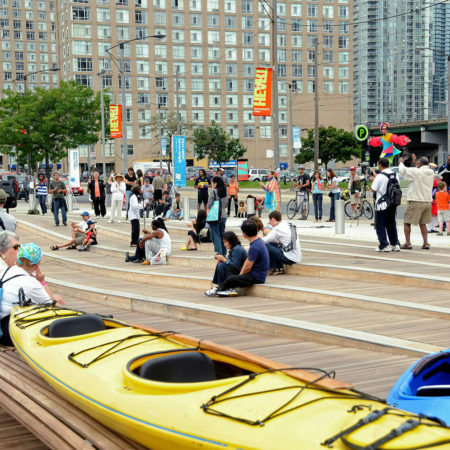 On Rees Wavedeck, people like to fish or gather for canoe classes, whereas on Parliament Wavedeck, visitors can learn about the ecology of the Waterfront. 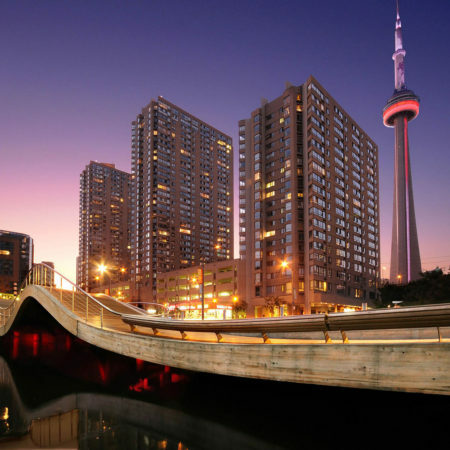 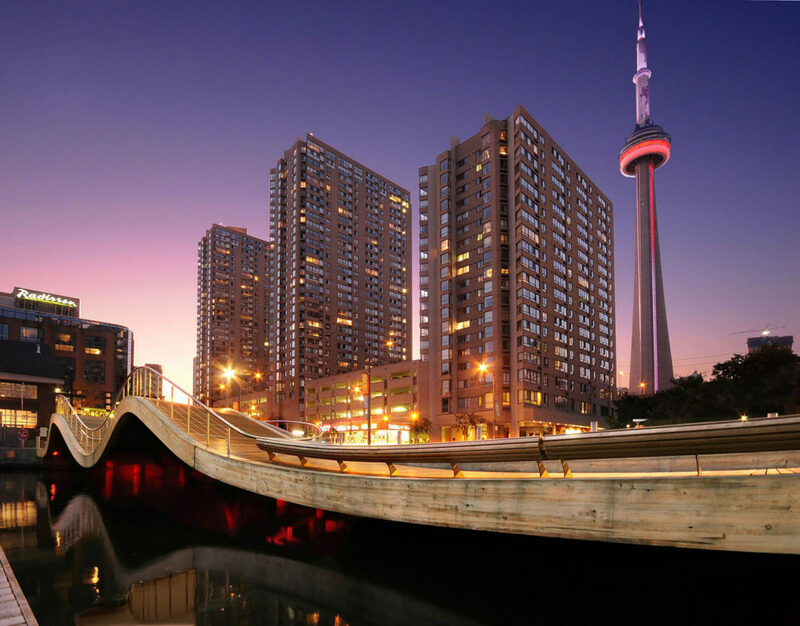 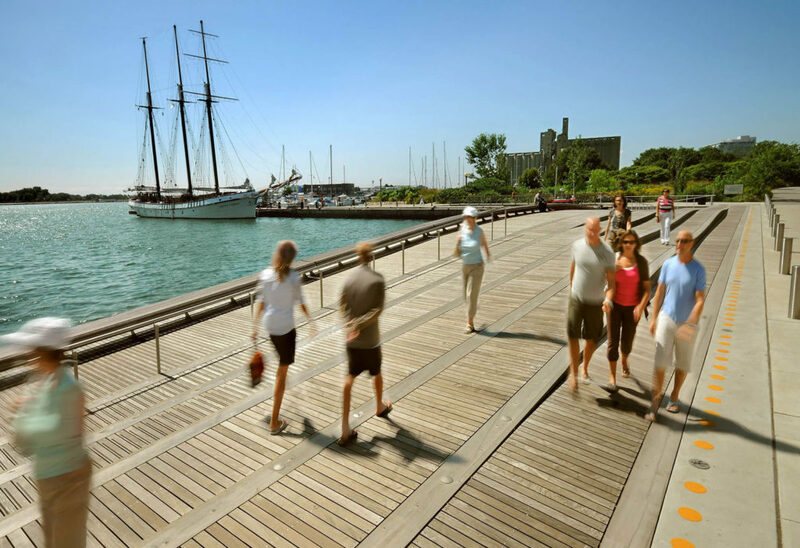 Toronto’s diverse neighborhoods are connected with the waterfront by means of green and lively spaces such as Harbour Square Park or Sugar Beach, perfect for relaxing or having a picnic while enjoying magnificent lake views. 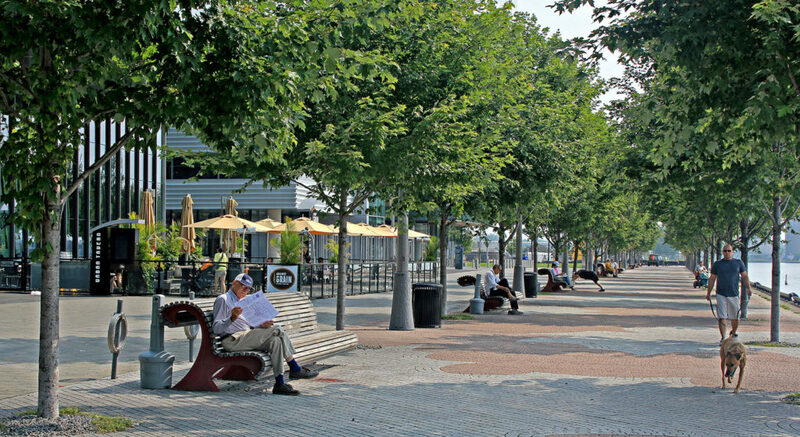 The north side of Queens Quay is planted with a mix of Maples, Honey Locust, Elms and Lindens. 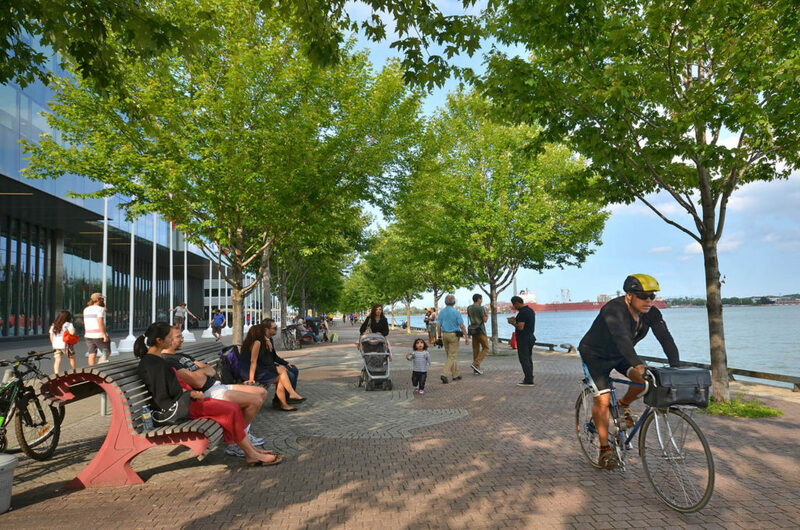 On the south side, London Plane trees are lining the promenade and bike trail. 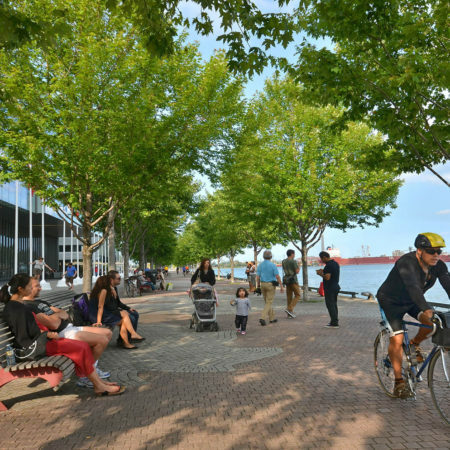 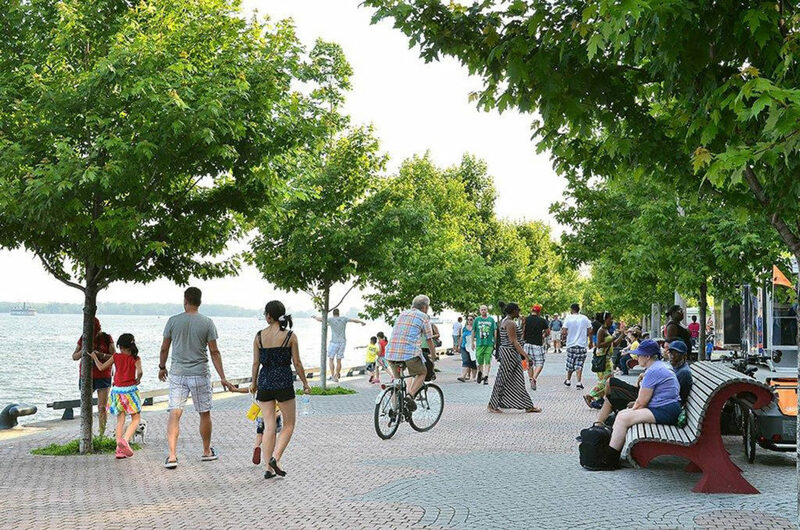 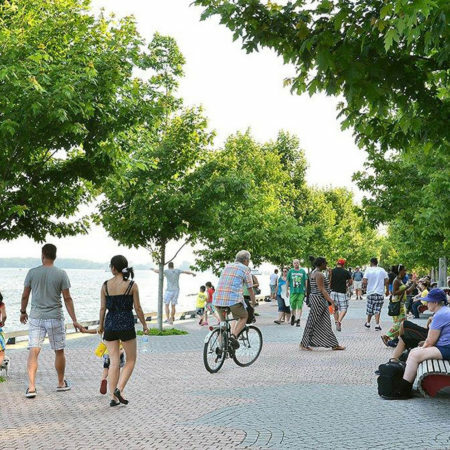 All 240 new trees on the promenade were planted utilizing deep root silva cells, hollow frames that guarantee a generous 30m³ of soil per tree, while supporting the weight of the pavement above, to promote the growth of healthy trees. 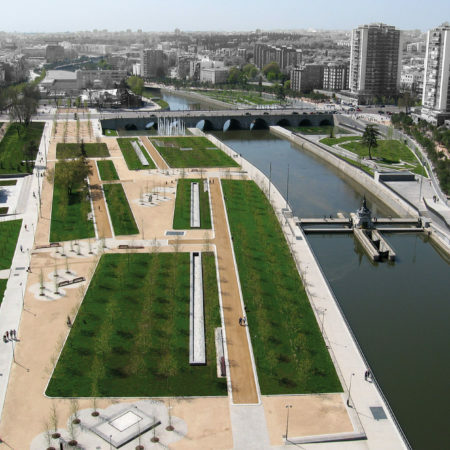 A passive irrigation system that is integrated into the municipal storm system supports them. 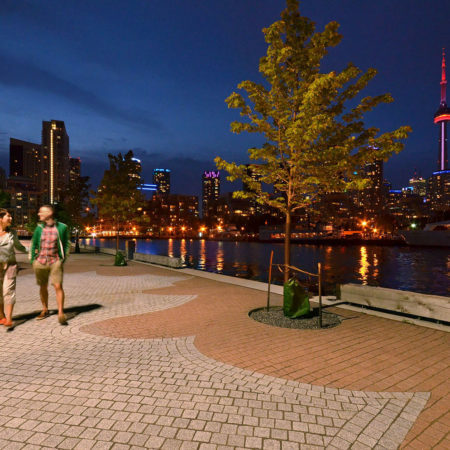 It is designed to collect surface runoff via custom-designed catch basins and reduces the volume of water entering the storm system by 47 %. 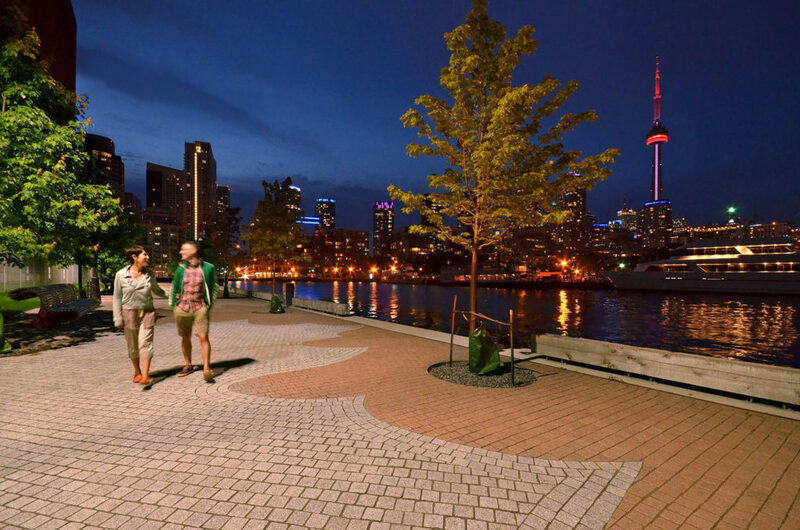 The streetscape features generous sidewalks and a promenade constructed of over 2.5 million locally sourced granite cobbles, hand-laid in a mosaic with details inspired by the iconic Canadian maple leaf. 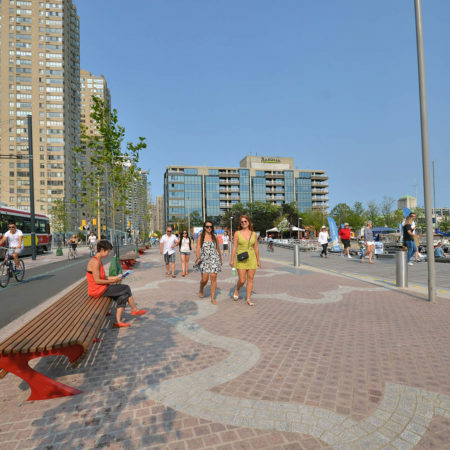 Extensive consultation with adjacent property owners allowed the granite paving to extend from the curb to building facades, crossing property lines and vastly increasing the visual limits of the public realm. 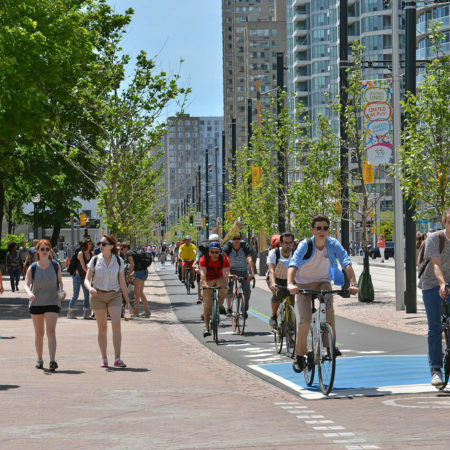 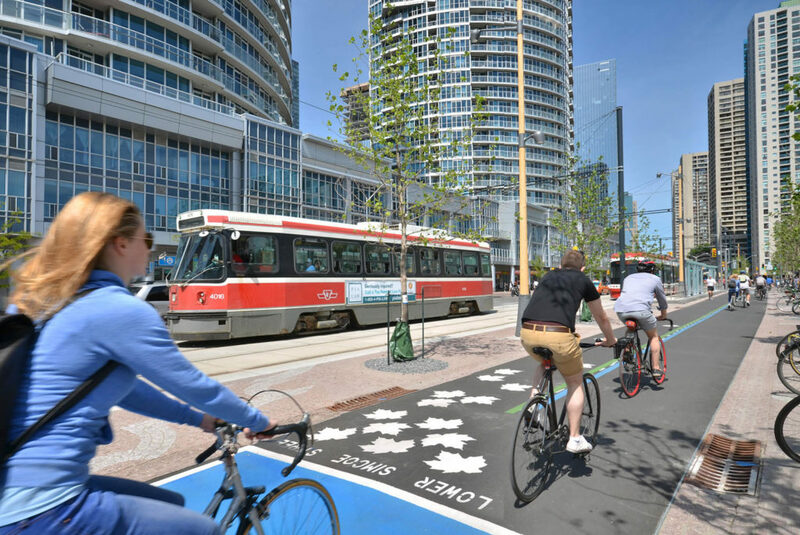 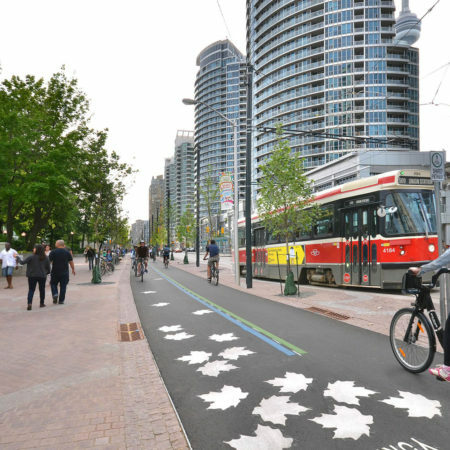 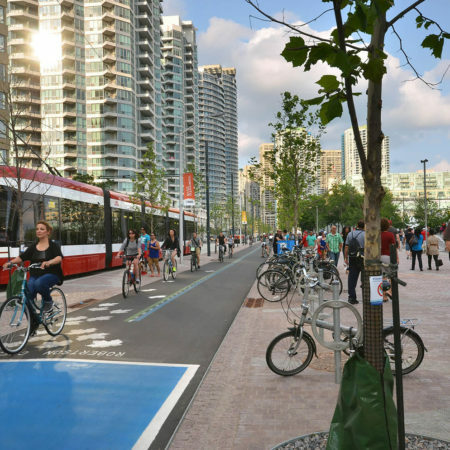 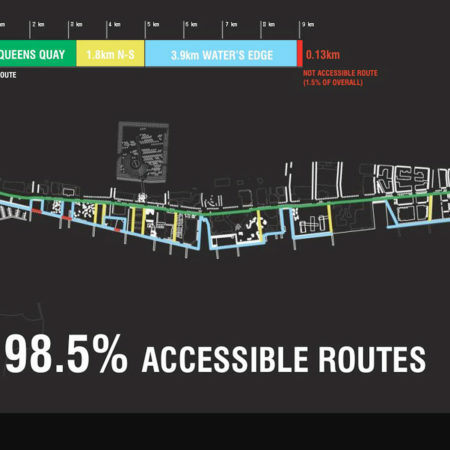 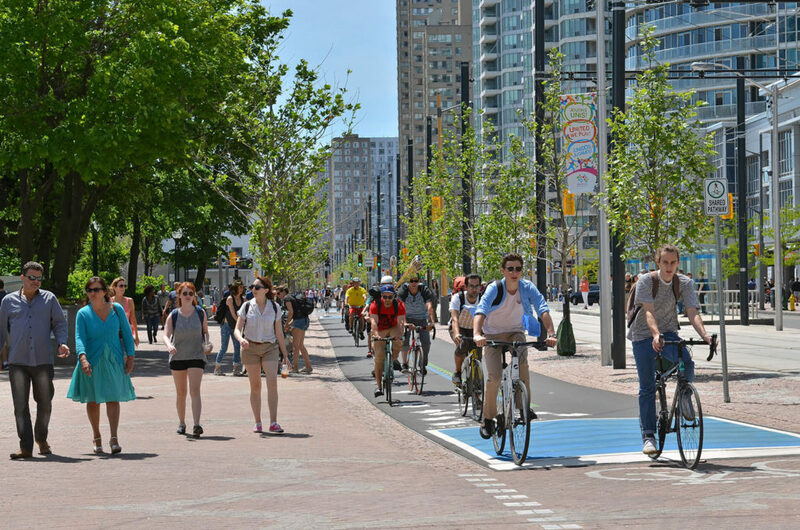 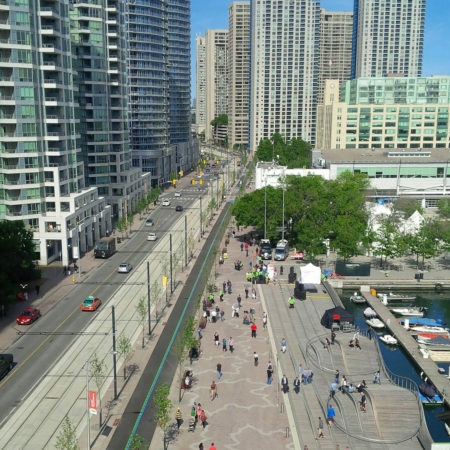 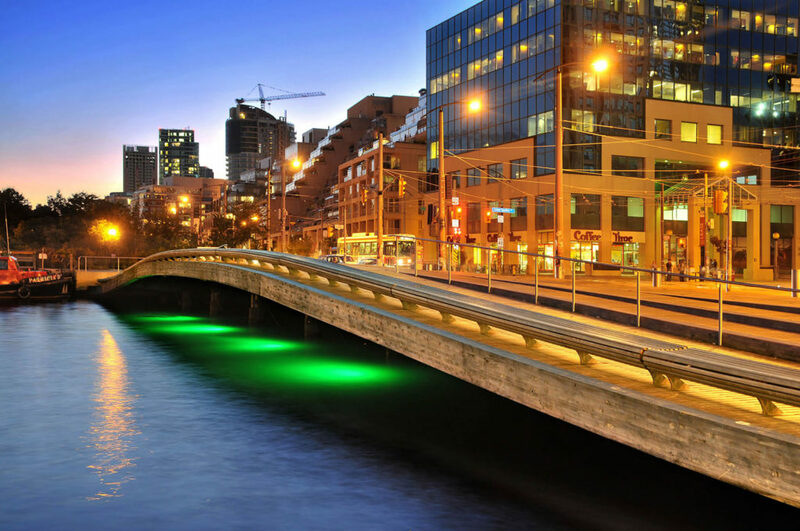 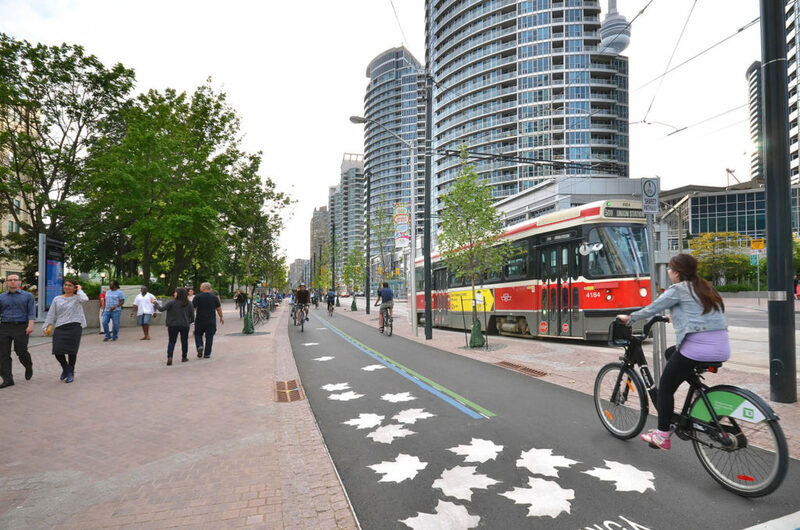 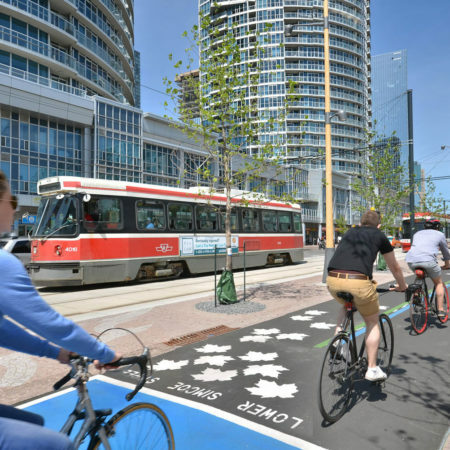 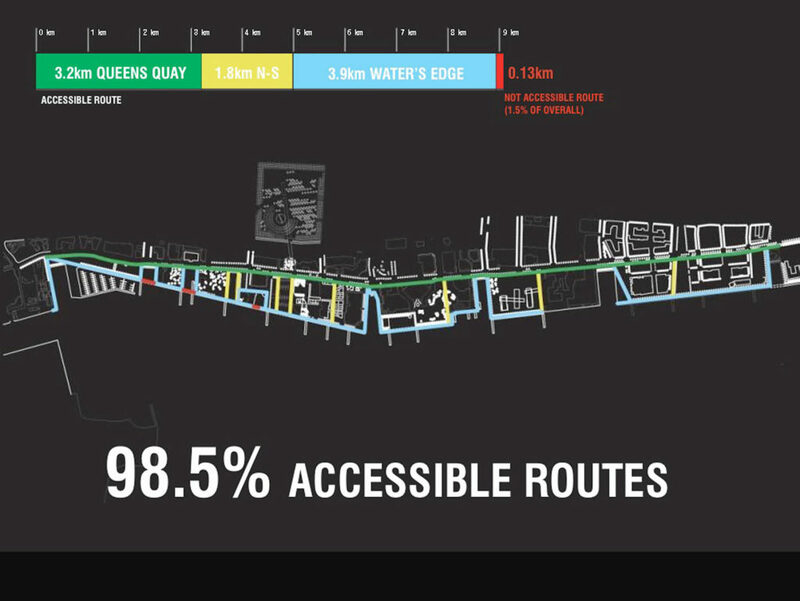 The Queens Quay revitalization was one of the most complex street reconstruction projects in Toronto’s history. 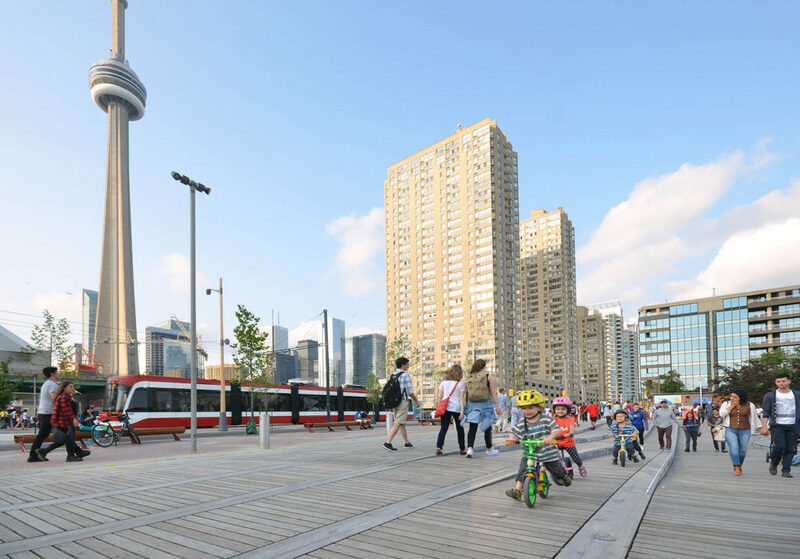 After an extensive environmental assessment and years of public consultation, Queen’s Quay and the Toronto Central Waterfront have been transformed into a landmark. 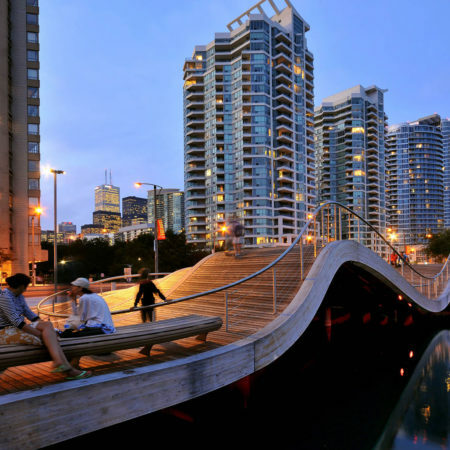 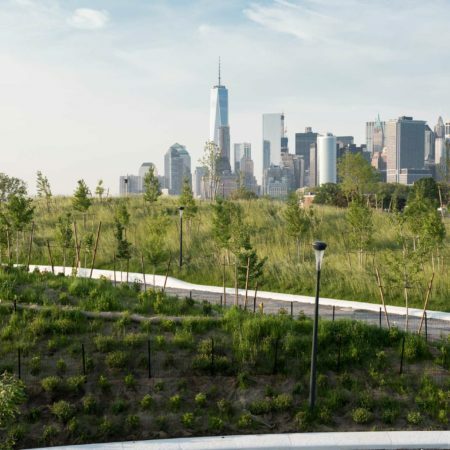 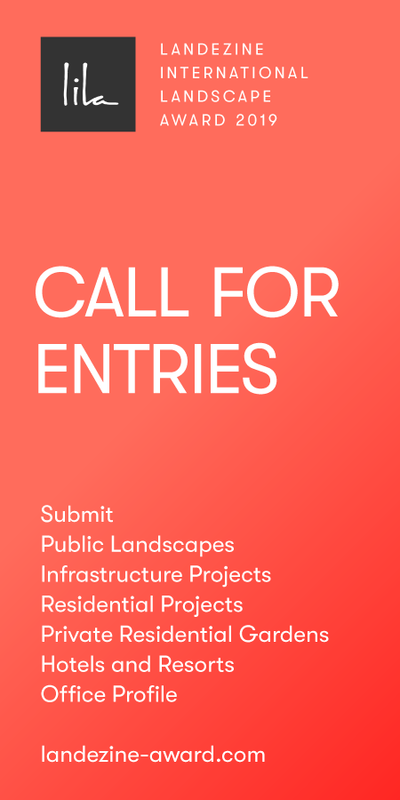 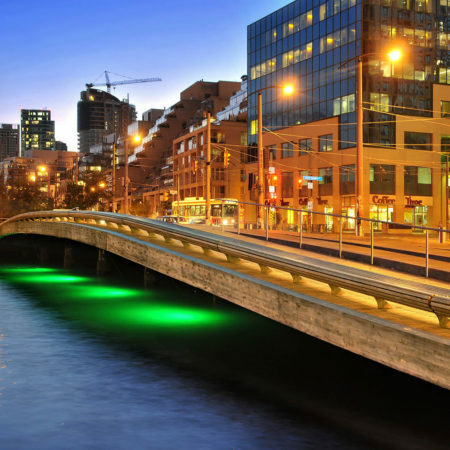 Characterized by extensive public realm improvements and sub-surface infrastructure upgrades, the project exemplifies thoughtful twenty-first-century urbanism and integrated public space design. 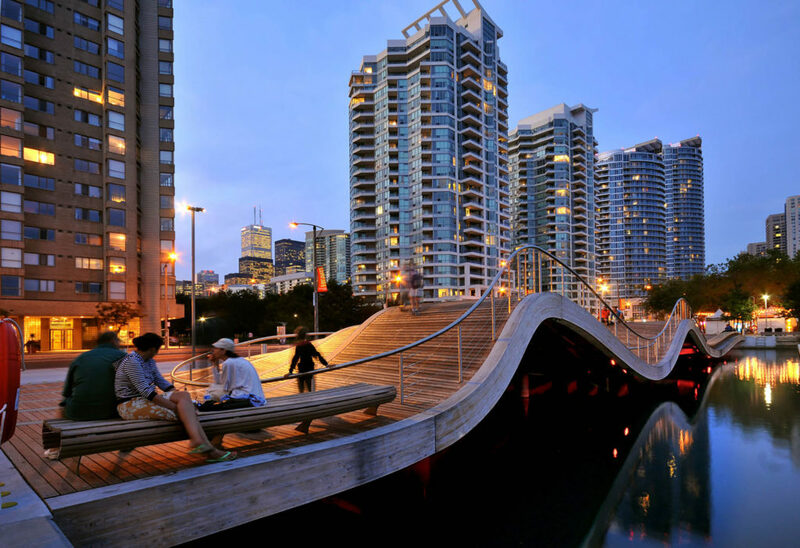 The design constitutes a sustainable civic space that honors, revitalizes and inspires the legacy of Toronto; a grand civic meeting place, which is both beautiful and functional and directly reflects the needs and desires of those who live, work and play here. 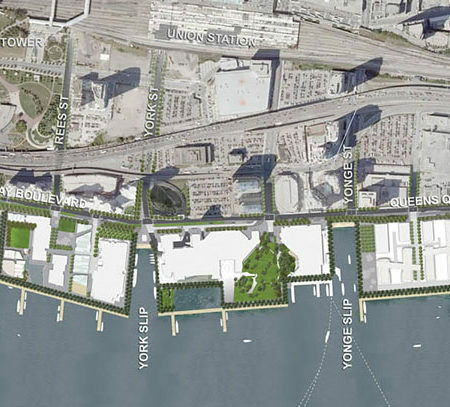 Entrant office name: West 8 urban design and landscape architecture b.v.
Year Built: Queens Quay was completed in 2015. 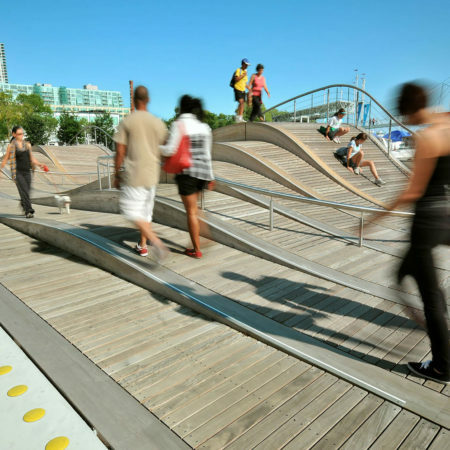 Additional consultation by Mulvey + Banani.